SAN FRANCISCO/MEXICO CITY — Amazon, Facebook and other U.S. tech companies are expanding operations south of the border as Mexico works to capitalize on the Trump administration’s anti-immigration stance. Since the beginning of the year, Amazon.com has opened a new engineering office in Mexico City, while Facebook Inc has partnered with local groups to develop technical talent in the region. Oracle Corp. plans to expand its offices in the Pacific coast state of Jalisco, local officials said, possibly bringing hundreds of jobs. In Guadalajara, Jalisco's capital, a new group devoted to recruiting startups expects to have 10 new companies in the region by year-end, with another 60 in the pipeline. And the landlord of choice for many startups, the shared-office juggernaut WeWork, said it has opened five locations and now serves 6,000 workers after debuting in Mexico City last September. President Donald Trump's efforts to reduce immigration to the United States, including new constraints on H-1B visas for skilled workers — which many tech companies rely on for attracting foreign talent — have prompted countries ranging from China to Canada to step up recruiting tech workers and startup companies that might once have found a home in the United States. For Mexico, there is an added urgency: More than 600,000 immigrants of Mexican origin are currently covered by the U.S. Deferred Action for Childhood Arrivals (DACA) program, which offers protection from deportation for illegal immigrants brought to the United States as children. Those individuals, known as Dreamers, may soon have to look for work abroad as a result of the Trump administration's September decision to let DACA expire. "This may be a good soft landing for people who are incredibly well prepared and may be able to take advantage of building their American Dream back in Mexico," said Bismarck Lepe, chief executive of Wizeline, a San Francisco tech firm with 260 employees in Mexico City and Guadalajara. Wizeline has invited Dreamers, who could now face deportation, to apply for jobs that would allow them to work in Mexico for a year before obtaining the necessary visa to return to the United States. Wizeline plans to use the L1 and TN visas, the latter of which is a visa covered by the North American Free Trade Agreement that allows citizens of Canada and Mexico to work in the United States for business purposes. To be sure, it is not yet clear if the benefit to Mexico's tech industry will be deep or long-lasting. The fate of the Dreamers remains uncertain as Congress could still pass legislation continuing the program. Mexican government statistics have not so far shown an uptick in temporary residence cards granted to foreign workers, suggesting that most prospective U.S. H-1B visa applicants are not yet looking south. Nonetheless, Mexico's tech sector has been adding jobs at a healthy rate in recent years, and all signs point to continued strength. Software job growth this year in Mexico's three largest metropolitan areas — Mexico City, Guadalajara and Monterrey — hit 8.8 percent, 7 percent and 10 percent, respectively, according to data compiled by LinkedIn. That is up from respective annual growth of 6.8 percent, 4.6 percent and 6.8 percent in 2016, LinkedIn told Reuters. "Where there is a strong engineering presence and opportunity, at some point it makes more sense to go to the market itself and establish an office there," said Steve McPherson, senior manager of software development for Amazon.com. The company has not disclosed the size of its technical team in Mexico, but McPherson said it is hiring aggressively. Facebook, meanwhile, has launched three programs this year in the Mexican capital, including a partnership with Dev.F, a local coding academy. These programs are the groundwork for a potential tech expansion into Mexico by the world's largest social media network, said Dev.F co-founder Manuel "Eme" Morato. Facebook now has close to 100 employees in Mexico. In Guadalajara, local nonprofit StartupGDL launched a program earlier this year to attract young, high-growth potential tech startups to the region. The pitch is simple: Universities in Jalisco graduate 7,000 to 8,000 engineers each year. The cost of living and wages are low by comparison to Silicon Valley. Guadalajara offers direct flights to the Bay Area and is only two hours ahead of California. And immigration into Mexico is easy for tech workers. Thus far in 2017, five foreign companies have opened offices in Guadalajara, according to StartupGDL, and the organization expects three to five more by year-end. “I look for people who are mission-focused, and I saw a lot of that down there,” said Pat Calhoun, chief executive of Espressive, a Santa Clara, California, tech firm that opened an office in Guadalajara in March. Pablo Lemus, mayor of Zapopan, a city in Jalisco that is home to companies including Oracle and the electronics manufacturer Flex, estimates that 40 to 50 startups may open offices in the city this year and next. Some companies are focused specifically on recruiting Dreamers. "They are highly capable people, bilingual in most cases, who have a very valiant experience,” said Luis Aguirre, vice president of government relations for contract electronics manufacturer Sanmina Corp., which has a large presence in Jalisco. “We will be gaining a great pool of talent." Zapopan has begun a campaign to attract Dreamers, placing brochures in Mexican consulates in the United States, said Lemus, the mayor. 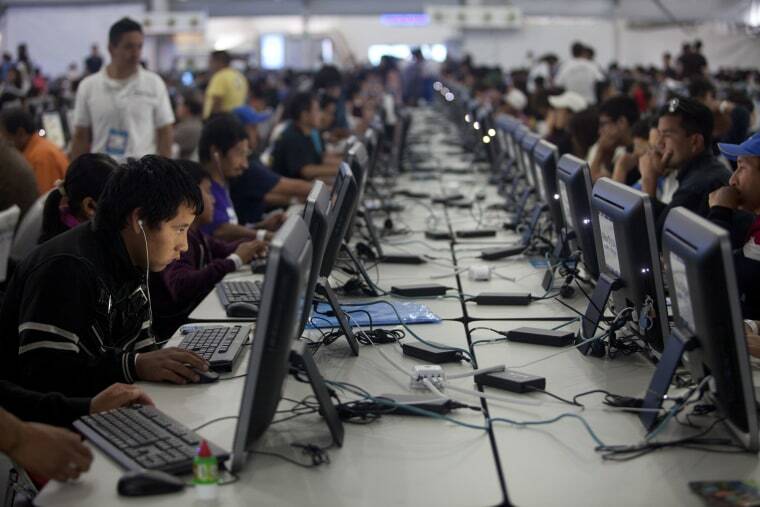 Employment in the tech sector in Jalisco has climbed steadily in recent years and is projected to reach 115,000 jobs in 2017, up from 105,000 in 2015, said Jaime Reyes, the state’s secretary of innovation, science and technology. The state is set to capitalize even further as Trump's immigration crackdown takes effect, Jalisco Governor Aristóteles Sandoval told Reuters, even though some tech companies are keeping quiet about their plans in the delicate U.S. political climate. Firms outside the United States are trying to capitalize on the Trump administration's changes to the H-1B visa program, which has become a much slower and more cumbersome route to obtaining a U.S. work permit. This year, applications for H-1B visas declined for the first time in five years. Satyen Timbadia, an Indian who owns a midsize IT outsourcing company in Mexico, said the H-1B restrictions influenced his decision to expand a planned engineering and design center in Guadalajara, which will accommodate 250 to 300 workers. "Trump has done only one thing — make life easier for us," said Timbadia, CEO of Daksha Consulting. At Wizeline, one of the key benefits of operating in Mexico has been the ability to attract and relocate foreign workers. Since opening offices there in 2014, the company has brought in workers from France, India, China and other countries. In August, Wizeline relocated Egyptian software engineer Kareem Salah, 22. Salah was able to move to Mexico from Egypt within a month of graduating from college in Cairo and getting a job offer from Wizeline. “It was extremely easy,” Salah said.